Our Abpromise guarantee covers the use of ab225316 in the following tested applications. 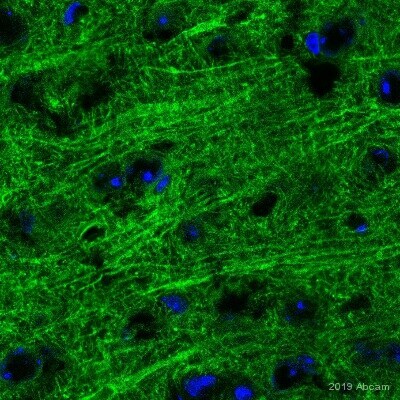 IHC image of MAP2 staining in a section of frozen normal human cerebral cortex*. The section was fixed using 10% formaldehyde in 1XPBS for 10 minutes. No antigen retrieval step was performed prior to staining. Non-specific protein-protein interactions were then blocked in TBS containing 0.025% (v/v) Triton X-100, 0.3M (w/v) glycine and 1% (w/v) BSA for 1h at room temperature. The section was then incubated overnight at +4°C in TBS containing 0.025% (v/v) Triton X-100 and 1% (w/v) BSA with ab225316 at 1/100 dilution (shown in green) and counterstained using ab195884, Rat monoclonal to Tubulin (Alexa Fluor® 647), at 1/250 dilution (shown in red). Nuclear DNA was labelled with DAPI (shown in blue). The section was then mounted using Fluoromount®. ab225316 has not yet been referenced specifically in any publications. Publishing research using ab225316? Please let us know so that we can cite the reference in this datasheet.